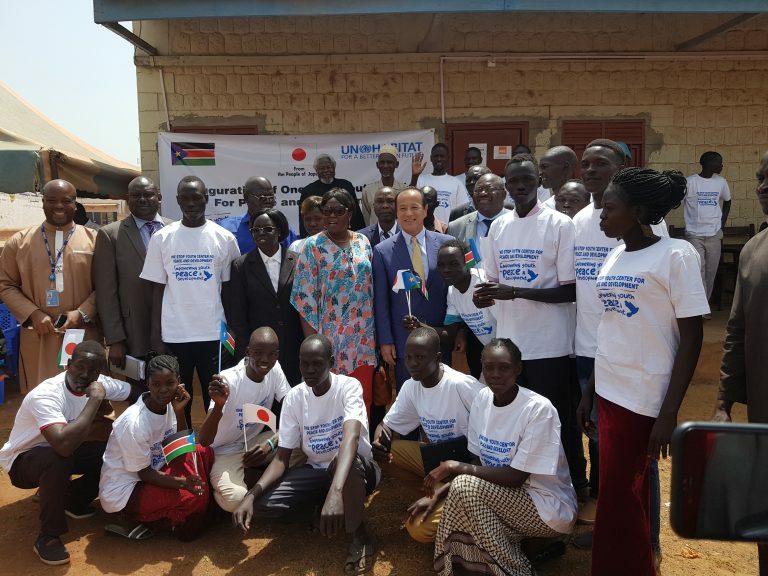 JUBA – Young people in Wau, in the North West of South Sudan, will have a place to relax, learn and come together following the opening of a One Stop Youth Centre with funding from Japan. The new One Stop Youth Centre provides a space for conflict resolution forums as well as opportunities for vocational and computer training, recreational activities job placement and entrepreneurial skills development. The centre has already trained 72 young men and women in conflict resolution and trauma healing and 170 youth have enrolled in computer, tailoring and English courses, according to a statement. Up to 100 young people use the sports facilities daily and the Centre has attracted youth from all over the state including internally displaced people. The Centres involve a partnership between UN-Habitat, South Sudan’s national and local governments, civil society, youths, and the private sector. During the inauguration, the Japanese Ambassador to South Sudan, Mr. Seiji Okada handed equipment for basketball, volleyball and handball to the Centre in the presence of the Governor, the national Minister of Culture Youth and Sports and the Wau State Minister of Information, Culture, Youth and Sports. The Japanese Ambassador called on the youth to dream big and develop the country. “The next responsibility for the development of South Sudan lies with you young people,” said Ambassador Okada.